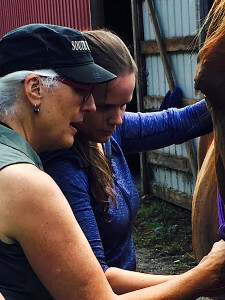 I love offering workshops for horse people who want to learn some bodywork strokes to use with their horse(s) in a friendly environment of respect for both horse and human. 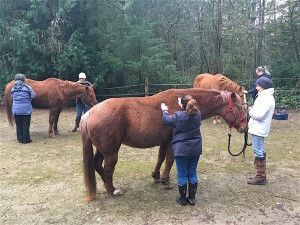 Clinics incorporate anatomy, bodywork strokes, horse body language, and mindfulness with hands on practice. The Intro will give you a taste, and the follow on courses include more in depth material and more practice time. See the descriptions below. I am available to come to your barn to teach these clinics. Please email me to set up a phone call to discuss details and availability. To register, please use the buttons below. See the Clinic FAQs page for details about the registration process and other questions. UPDATE – I took a pause from teaching in August 2017 while I searched for and moved to my farm in Kitsap County. Look for new clinic offerings in 2019! Check back here, on Facebook, or sign up for my email news to be notified. Your horse wants you to take this workshop! First, we’ll learn about the wonders of fascia (aka connective tissue), what happens to it, 4 ways to care for fascia, and the benefits of releasing restrictions in fascia for your horse’s movement, mood, and health. Then we’ll spend most of our time learning several basic, effective bodywork strokes to support your horse’s well being with time to practice on horses who already like being massaged. Be prepared for 5-hours of fun, hands on learning. Limited to 8 participants. Equine Structural Integration – Learn to do a full session with (or without) your own horse. This is a structured session using specific strokes with specific parts of the body. At the end of the workshop, each participant (who wishes) completes a whole bodywork session with their own horse with coaching from me. Learning to Speak Horse – Understanding equine body language enhances your training and connection with them. Plus it is fascinating! Equine Anatomy for Horse Owners – The better we understand our horses, the better we can care for them, talk with the farrier and vet. We’ll cover bones, muscles, and names of body parts to help you talk with your vet. We’ll also discuss how a horse’s nervous systems and digestion work for more effective horsekeeping and riding. Assessing Your Own Horse – You know your horse best. Learn several non-technical ways to assess your horse’s muscles, body, and tension to hlep you talk with the vet, farrier, trainer, and bodyworker about your horse and better advocate for his care. Personal Energy & Your Horse – Horses don’t care what you know, they care how it feels when you stand with them. Learn what questions to ask yourself before you step into a horse’s personal space. 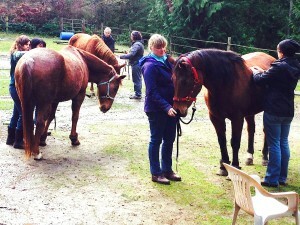 We’ll do simple exercises with horses to learn more about what does and does not work. Your horse will thank you! Other workshops – What would you and your group like to learn? Let’s talk about how to customize an experience to fit the interest and experience of your group. Please email about your ideas and to set up time to discuss on the phone. Can’t attend a clinic? Have a particular issue you want help with? Consider one-on-one coaching for you to do bodywork with your horse. Together, we’ll do a full session with your horse. Get stroke-by-stroke coaching from me on working with your horse. Interested? Email to set up time for a phone call to discuss. One-on-one coaching to do bodywork with your horse – Coaching really helps to learn and remember what we are doing. Individual bodywork sessions with or without coaching can be offered the day before or after a workshop. Practice & Refresher Sessions – Additional practice time with me to go deeper in your learning or refresh what you learned before. Can be solo or small group.